​Price range: $92,000 (P200 R-Dynamic S) to $117,900 (P300 R-Dynamic HSE). Powertrains: 2.0-litre turbo-diesel (D) and turbo-petrol (P) engines: D180 132kW/430Nm (0-100kmh 9.3 seconds), P200 147kW/320Nm (9.5sec), P250 184kW/365Nm (7.5sec), P300 221kW/400Nm (6.6sec). Nine-speed automatic, all-wheel drive. It might look the same, but the second-generation Range Rover Evoque is all-new and a lot more sophisticated than the model it replaces. Forget about the wedgy three-door and weird convertible: they're gone. This new model is a functional SUV and five-door only. Visual character and dynamics are now more aligned with the rest of the Range Rover family. Evoque is also future-proofed, on a platform designed for electrification. Mild hybrid technology is here now and there will be a plug-in hybrid next year. It's still compact: the footprint is within a few millimetres of the outgoing five-door, despite a 20mm increase in wheelbase. Integral Link suspension at the rear has helped with a 10 per cent increase in bootspace, to 591 litres. 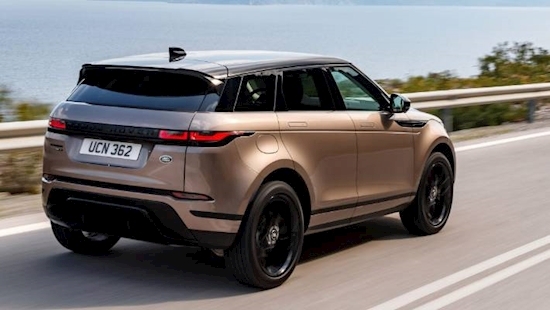 Design-wise, it's like the Velar post-liposuction. The profile is still clearly Evoque, but the super-slim LED headlights, wide rear garnish and flush doorhandles are pure Velar. Note the continuation of the tiny "letterbox" rear window. Now meet the ClearSight rearvision mirror: it can act as a video screen, delivering images from a camera mounted in the antenna on the roof (and at a wider angle than you see through the conventional glass). 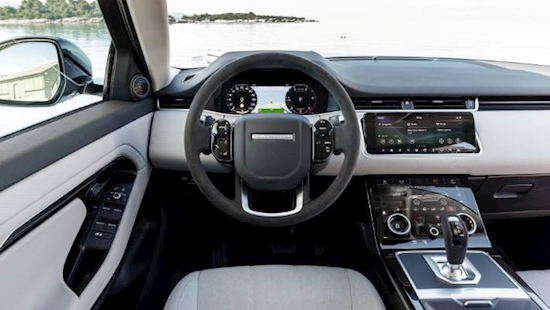 The interior picks up a slightly simplified version of the dual touch-screen layout in the Velar. Swish, bit fingerprint-prone. Evoque will be launched in New Zealand next month in P200, P250 and P300 turbo-petrol models, as well as a D180 turbo-diesel. All are AWD. Off-road ability gets a giddy-up with the Terrain Response 2 system as standard, including an Auto setting that lets the car make up its own mind about which modes will work best for a given driving situation. Adaptive Dynamics (with variable dampers) is available, as is the Active Driveline that decouples to 2WD in steady driving, has a twin-clutch rear axle for true torque vectoring and a locking rear differential. Full NZ specification is yet to come, but we do know that Adaptive Cruise Control, Meridian 380W stereo, keyless entry and heated front seats will be standard. 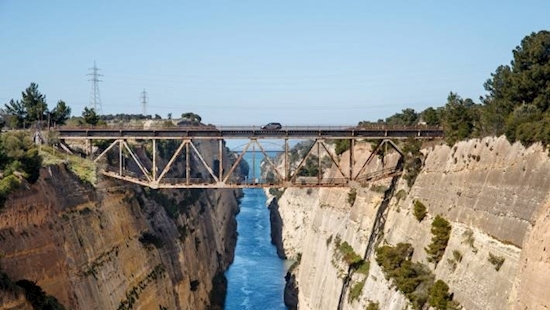 Return from Athens down to the east coast of the Peloponnese: urban, motorway, some technical off-tarmac stuff and a short-but-spectacular run across a railway bridge 100m above the Corinth Canal. That last thing was not essential for evaluating the car, although it did give those with Ground View a chance to try out this world-first tech. 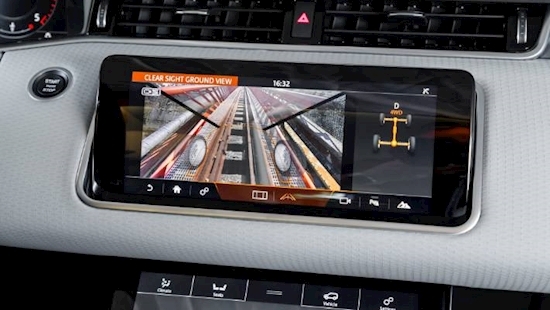 Ground View projects an image of the front wheels on the road through an "invisible" engine bay onto the centre console screen. Land Rover reckons it's just as handy for urban parking as it is for preventing you falling off a massive bridge. On the tarmac, Evoque feels grown up. It also feels heavy, because it is: up to 1900kg depending on model. It doesn't just look like a Velar, it weighs as much as one. 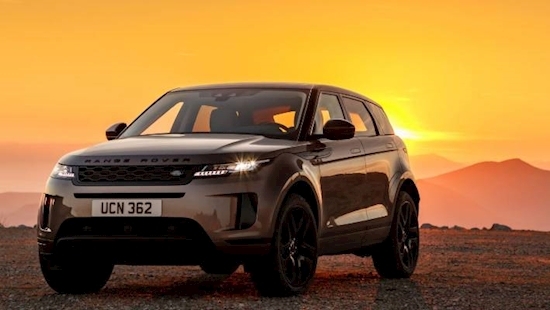 The platform is mostly high-strength steel rather than aluminium, it's stiffer than the outgoing model and the new Evoque is carrying a lot of technology. Lighter would be better, but that heft does contribute to improved ride and a more surefooted handling stance. 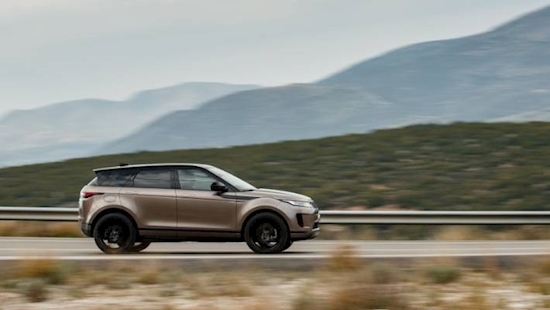 The Evoque is no longer chuckable in corners, but it does flow through the turns with weighty, consistent steering and a fluid feel to the chassis. It's softer, too. You can have monster 21-inch wheels, but even then it's a car that lopes confidently through corners rather than dancing on demand. Sounds like classic Range Rover character, right? That's quite deliberate on the part of Land Rover. Don't expect off-road ability to equal its big brothers though; axle articulation is a limiting factor for one thing. But approach and departure angles are good for a compact-SUV: 21/30 degrees for the R-Dynamic we'll get, or 25/30 in normal trim. Accomplished all-wheel drive and that strong platform saw the Evoque through some challenging off-tarmac work on our drive. Tough-stuff tech includes Hill Descent Control, Gradient Release Control, All Surface Progress Control (a kind of off-road cruise control) and Wade Sensing, to help you through up to 600mm of water. That's a tricky question, for two reasons. First, we only drove the P250. Second, that P250 wasn't exactly as we'll see it here. 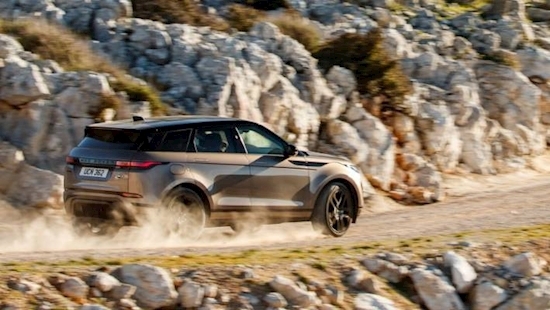 Mild hybrid (MHEV) technology is key for Evoque. It employs a 48-volt electrical system and lithium-ion battery to harvest energy normally lost in deceleration or braking, using it to enhance stop-start (the powertrain shuts down below 17kmh, for example) and assist acceleration to save fuel. But Land Rover NZ has opted out of MHEV on the D180, P200 and P250 models, presumably because there's a cost saving. Our test P250s were still MHEV, of course. Does that matter? 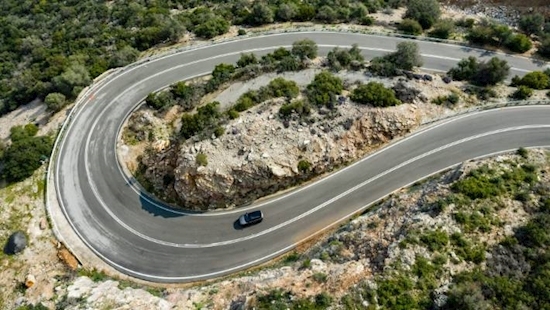 Arguably not, as outputs and power delivery are identical; MHEV is simply used to save fuel. The 184kW/365Nn 250 engine is impressive for its linear power delivery and refinement. It's smooth, impeded only by the odd staccato gearchange from the nine-speed gearbox; at 130kmh on the motorway (relax, it was legal) it was near-silent. 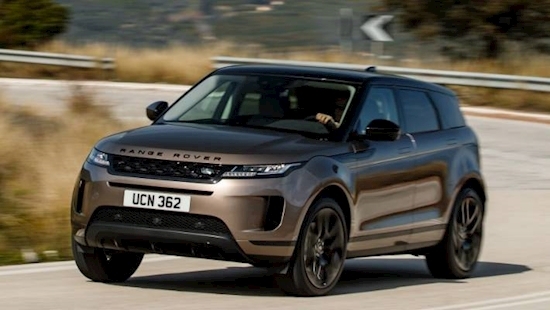 The new Evoque has Range Rover refinement, even with a four-cylinder engine. And there will indeed be a mild-hybrid Evoque for NZ: the flagship P300 has the technology as standard. Evoque has kept city friendly exterior dimensions but stepped up in presence, technology and practicality. It's well engineered and well equipped, but also expensive; the market is awash with cheaper compact-premium SUVs from Audi, BMW, Jaguar, Lexus, Mercedes-Benz and Volvo.